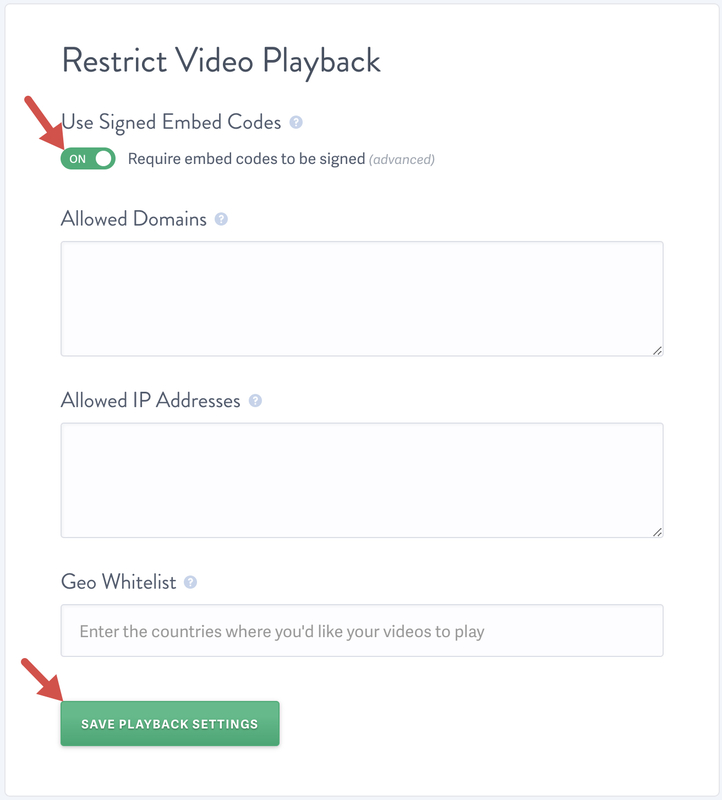 Signed embed codes are an alternative to our Allowed Domains feature for preventing your videos from being embedded where you do not want them to be. While our Allowed Domains feature is based upon verifying the referrer information sent by the web browser, signed embed codes are based upon verifying a signature appended to your embed code that is generated using a secret signing key. Signed embed codes allow you to set an expiration time for your embed code, so that a particular embed code is only valid for a limited time ensuring that the embed code cannot be reused. Who should use signed embed codes? Signed embed codes are meant to be used on sites that generate dynamic HTML content. Therefore, they require some programming knowledge in order to properly sign the embed codes. When using signed embed codes the embed code stays essentially the same with the addition of two new parameters appended to the src attribute of the iframe. The signature parameter is dynamically generated by your application using your secret signing key, and SproutVideo will not serve the video unless the signature is valid and has not expired. You can also enable signed embed codes for all videos in your account. Just navigate to Account Settings > Video Settings and scroll down to the ‘Restrict Video Playback’ field. Enable the toggle for ‘Require Embed Codes to Be Signed’ and click the ‘Save Playback Settings’ button. We use a URL signing protocol very similar to the OAUTH1 signing protocol using a Base64-encoded hash generated using the HMAC-SHA1 algorithm. Now that we have our string, it’s time to sign it. First you’ll need your API key to sign the string. You can find your API key here. Finally, the signature is calculated by passing the signature base string and signing key to the HMAC-SHA1 hashing algorithm. The details of the algorithm are explained in depth here, but thankfully there are implementations of HMAC-SHA1 available for every popular language. For example, Ruby has the OpenSSL library and PHP has the hash_hmac function. And your video should appear.